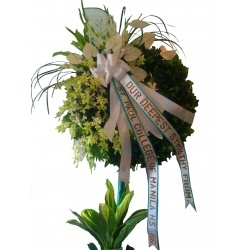 Florabella offers bridal flower design and wedding arrangement services in the Philippines. The bride is the star of the wedding and our bridal flower design will ensure that the lovely bride will be a complete beauty even with her accessory such as the bride's floral bouquet. The bridal bouquet will have the freshest flowers and the most unique and enticing floral arrangement. Your as the bride or your bride will surely appreciate the thought and effort that goes with the design of bridal flower and floral bouquet. You can rest assured that your wedding will be a smash, classy and elegant with the knowledge that one of the Philippines best wedding arrangement designer will handle the design and creation of your bridal flower. Florabella specializes in the delivery of fresh flowers and is aware of the flower supply situation, and thus will not specify a flower that is difficult to source. We are a brick and mortar flower store with direct access to different types of flowers from roses, carnations, tulips, mums, orchids and other exotic flower choices. The bridal flower is most often held by the bride as a bouquet. We can also prepare a vase that will function as a stand during the reception. There are also other options for the bridal flower, such as putting it on a basket, very appropriate and quite unique especially for garden weddings. We're certain you have a lot of questions about bridal flower design. Just contact us on our online form or on our telephone and we'll get back to you the soonest. 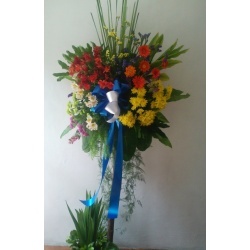 Thanks for visiting the Florabella online florist web site and we wish you a successful and beautiful wedding. In the meantime, below are our most popular wedding arrangement products.